"Preeminent theologian of the Reformed tradition Brian Gerrish has here set forth his much anticipated dogmatics in outline. He goes to the heart of essential Christian doctrines, adeptly engaging relevant biblical texts and key theologians. In the process, he conducts sustained conversations with Calvin and Schleiermacher—theologians for whom he is one of the foremost interpreters. Gerrish offers his own constructive conclusions in a set of theses, making good on his conviction that this is a living tradition inviting reinterpretations responsive to the context in which Christian faith is to be lived out. Christian Faith is truly a rich feast and will likely be recognized as one of the finest works of dogmatic theology in our time." "Brian Gerrish's long-awaited Christian Faith: Dogmatics in Outline is a gem of ripe historical scholarship and striking theological construction. 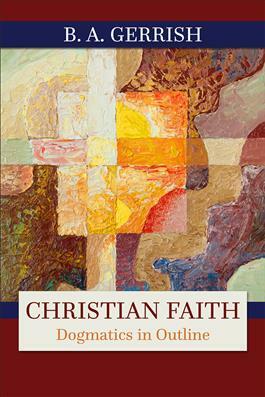 Organized in two major parts, the first, 'Creation,' analyzes the 'elemental faith' presupposed by Christian faith, and the second, `Redemption,' itself divided in two ('Christ and Christian Existence' and 'The Spirit and the Church'), examines the beliefs and dogmas in which 'the distinctively Christian way of having faith' is expressed. All twenty-one chapters, introduced by finely crafted theses, begin with helpful studies of the diverse biblical sources of a doctrine, followed by explorations of significant moments in the doctrine's development (with special attention to the work of Gerrish's two 'main guides,' Calvin and Schleiermacher), before finally advancing the author's own critical and constructive statement. The author's primary criteria of dogmatic theology-fidelity to the apostolic witness to Jesus Christ and pertinnence to contemporary thought and experience-are deployed throughout the work. Rigorous and readable, fresh and thought-provoking, Gerrish's volume is an outstanding resource for teachers and students of Christian dogmatics." "Guided by his major models, John Calvin and Friedrich Schleiermacher, Professor Brian Gerrish, in this profound and judicious work, has produced the most important Glaubenslehre since Ernst Troeltsch. Both deeply grounded in his Reformed tradition and ecumenical in tone and intention, this is a dogmatic theology which no serious Christian theologian, of whatsoever confession, should miss: a masterwork by a master."